Midnight Saturday, just got home from a long shift at work and decided to do a little hand loading demonstration. To start with, set up a full length sizing die in the press following the manufacturers instructions. Our next step is to lubricate the cases, you can use just about anything for a lubricant, just remember that whatever you use must be able to be cleaned off. My personal preference is Imperial sizing die wax but for large batches on our progressive we use a non stick cooking spray for economy purposes. Now all we do is run the brass into the full length sizing die until the shell holder bottoms out on the die, then pause for a second and lower the ram to remove your freshly sized case. After you full length resize your brass for the first time it will probably need to be trimmed. Consult a loading manual to find out what the maximum trim length for your specific brass is. 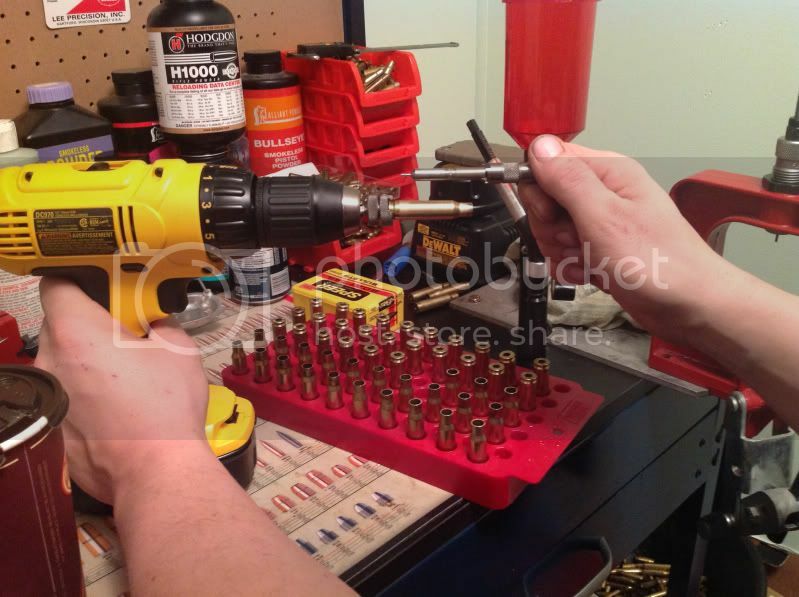 In this case we are reloading 308 Winchester in once fired federal brass. Our maximum length for the case is 2.015". While most of our brass is very close to that size, some of it is in excess of .030" which is dangerously long that need to be trimmed so that every piece of brass is a consistent length. I use a Lee trimmer that can be attached to a drill. They are very simple and inexpensive but only trim to one pre set length. So there we have it, most of the Lee trimmers that I have used will trim your bras from .005" to .010" under the maximum trim length. I have used other trimmers that are adjustable and some brass was trimmed a little bit too short but as long as its no more than roughly .020" under what the book says I don't think it would ever be a problem to shoot. So now that our brass has been resized and trimmed to length we will chamfer the inside and outside of the case. 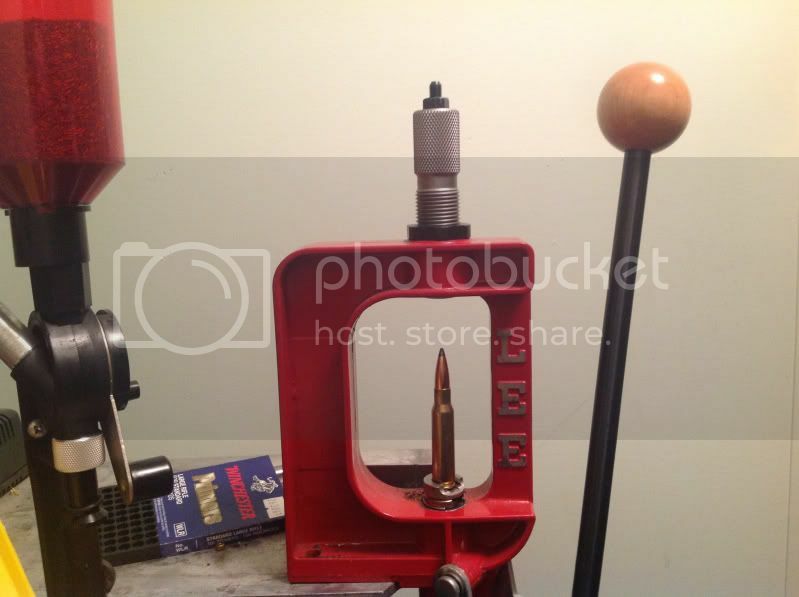 What I am doing in this batch of reloads is working up a hunting load for this coming fall season for my savage 308. 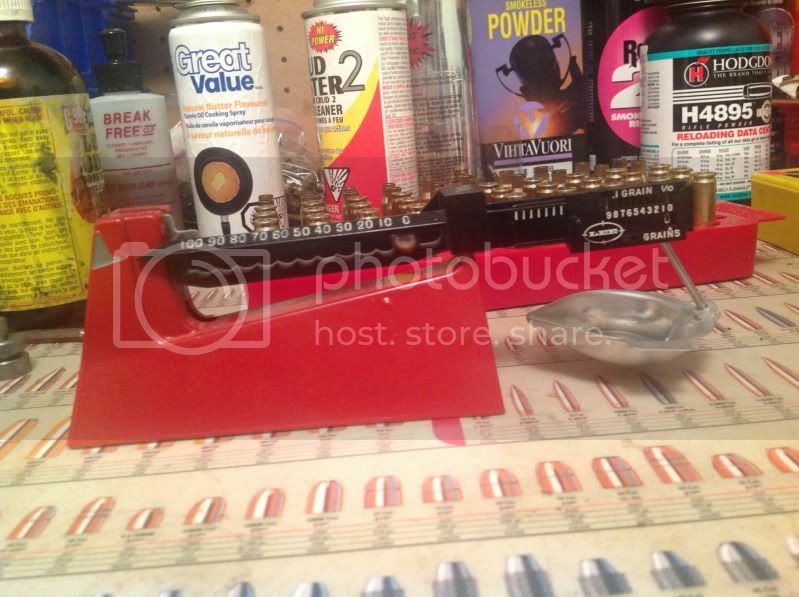 The load I want to try is 180 grain bullet over a Winchester large rifle primer and Varget powder. When you prime your brass you should watch for primers that push in with little to no effort, that is a sign of a worn primer pocket and it makes the brass unsafe to shoot. You should flatten the brass with the worn primer pockets and discard. It is extremely important to zero your scale every single time you start a new batch. Once your scale is set up and zeroed it should not be moved until you are finished. Starting from zero we follow the instructions to set the scale for our desired weight, once I dial that in I set my powder thrower to throw a charge just under my goal and use my Lyman trickler to get the charge weight perfect on the scale, you don't need a trickler, I use a spoon more often then anything else but it makes for a pretty picture! 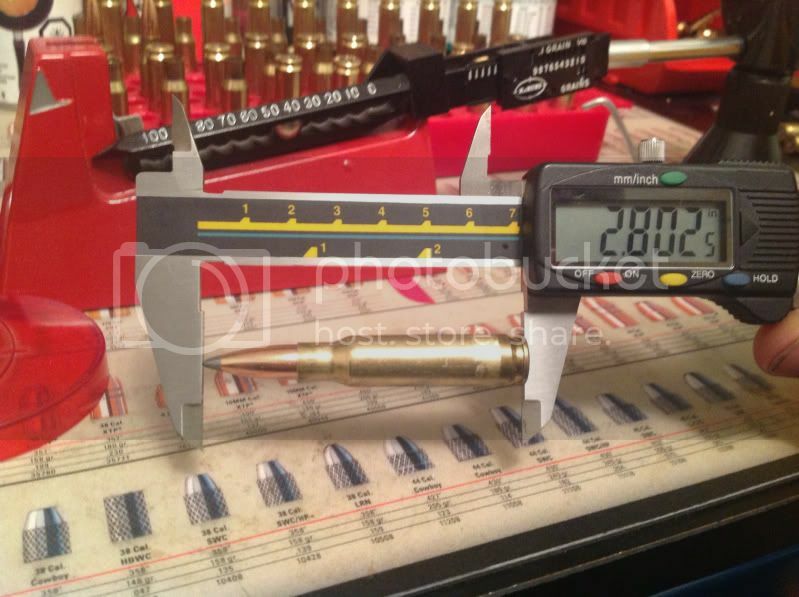 Once we have our charge measured its time to dump it into a primed case and setup our bullet seating die, you can practice on empty unprimed but resized cases to get the OAL correct and keep one as a dummy round to setup the die next time but once you have done this a few hundred times you get a pretty good feel for making small adjustments until its where you want it. 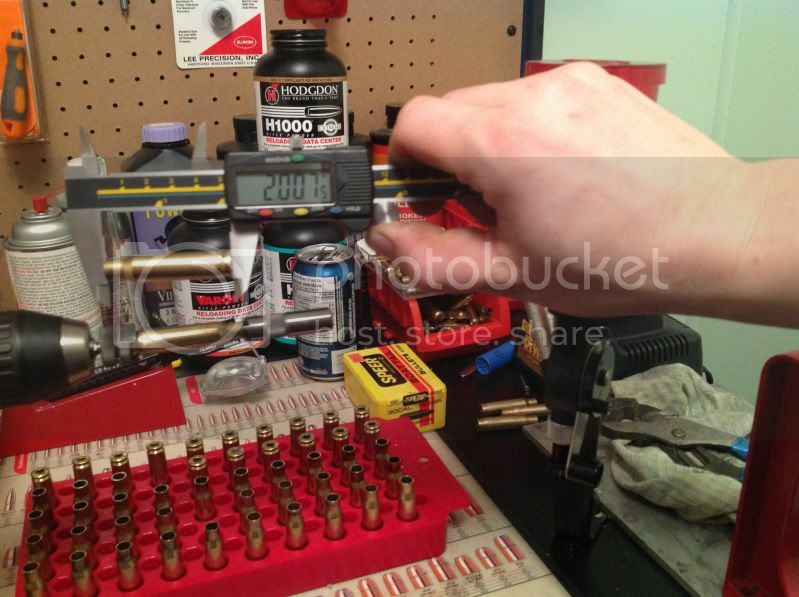 For the average Joe or Jane who wants to get into loading there own ammo I suggest you use the OAL listed in the book, setup your seating die and measure the first round so it's close to perfect and just run with it, as long as your OAL doesn't exceed .020" and keep growing then chances are all your seeing is a variation or imperfection in the very tip of the bullet. This is meant to be a step by step for the novice reloader, if you have questions please ask and I will do my best to answer... If I get a positive response I will go more in depth into things such as die setup for various different effects and maybe even a step by step for precision reloading. 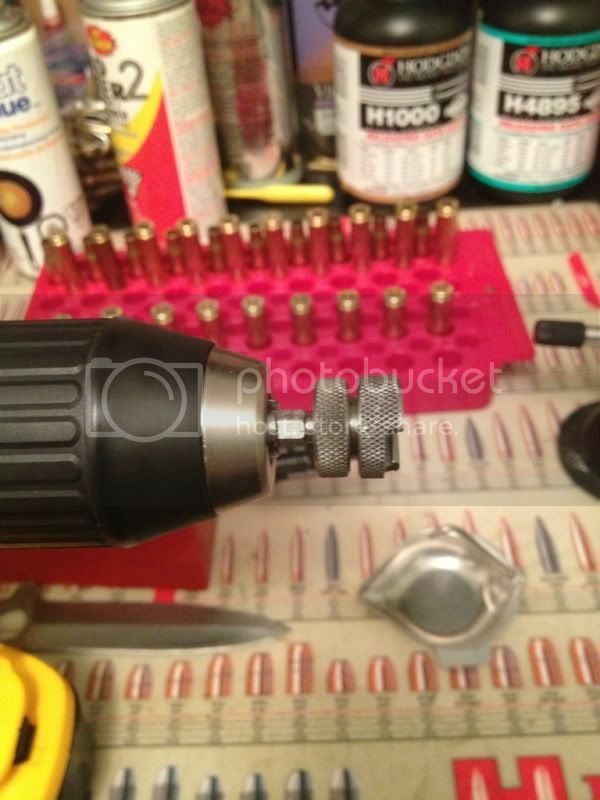 reloading is something i am very interested in .. thanks for taking the time to put this thread and all the pictures together. They work great. I use them all the time. Like the OP stated they only trim to one size but they are super fast and pretty accurate. They cost about $6 for the pilot and $15 or so for the holder and the mill. But once you have the holder and mill you only need to buy a new pilot to trim a new caliber. Lee trimmers are all chambering specific. So you will need one for each type you reload for....very easy to use and usually around $8 for each individual one. -Not all loads listed in all manuals will be safe in all rifles. That is why you start at the minimum load, and work up. -It is very important to learn to recognize pressure signs. 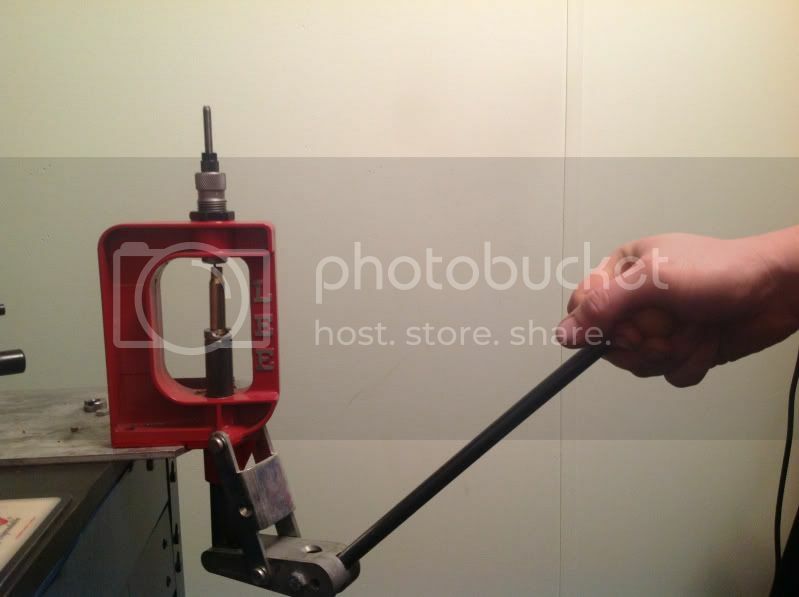 Pressure signs can be seen in several forms, from heavy bolt lift after firing, to extrusion marks on the case head,to excessive case head expansion, to loose primer pockets after only a few loads. I recommend that a new loader does some research online, to find more information on identifying pressure signs. If you notice pressure signs, stop shooting, until you deal with the pressure issue. -Those loose primer pockets are not worn primer pockets, they are stretched primer pockets. If you encounter loose primer pockets after only a few loadings, your loads are too hot. 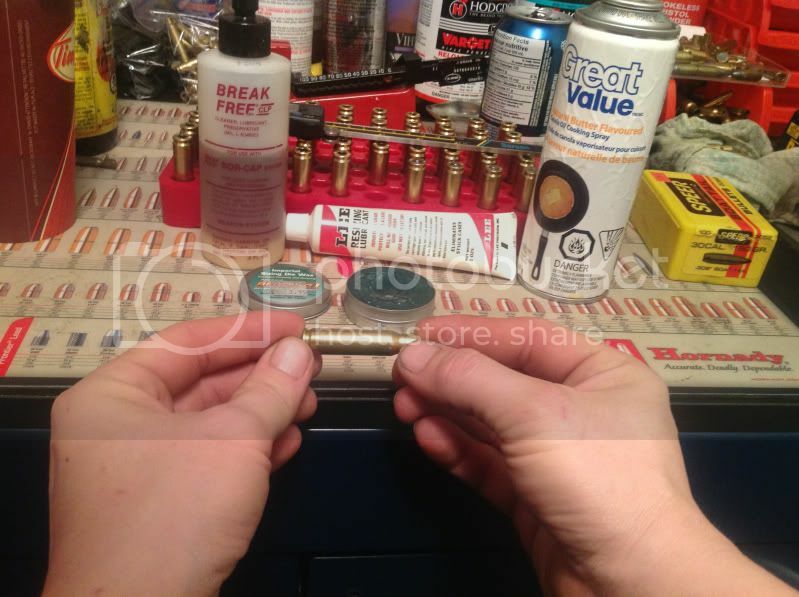 -Be sure to avoid lube on the shoulder of the case, as lube on the shoulder will cause dents in your cases. If you are seeing dents in the shoulders, clean your sizing die. -Be sure to learn how to adjust your seating die properly. A properly adjusted seating die will not contact the shoulder of a sized case. 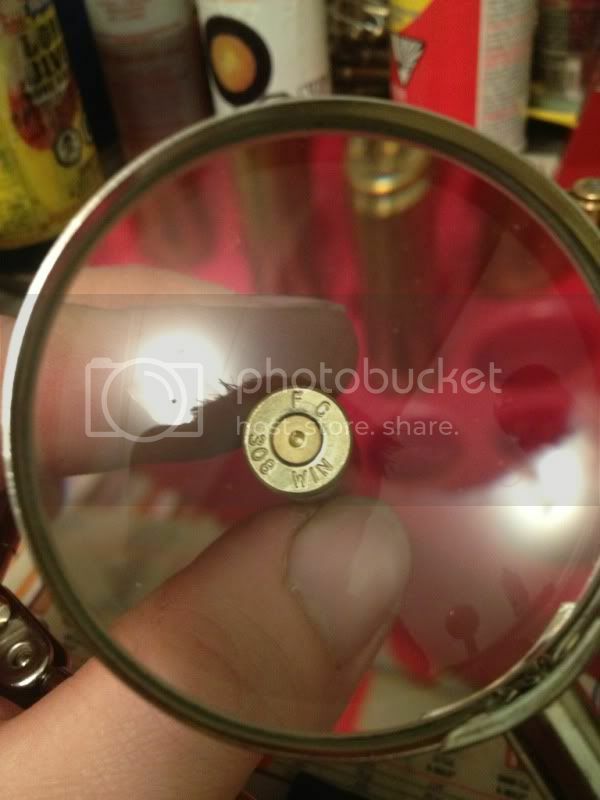 Adjusting the seating die incorrectly will push back the shoulder, and possibly bell it, so the rounds won't chamber. 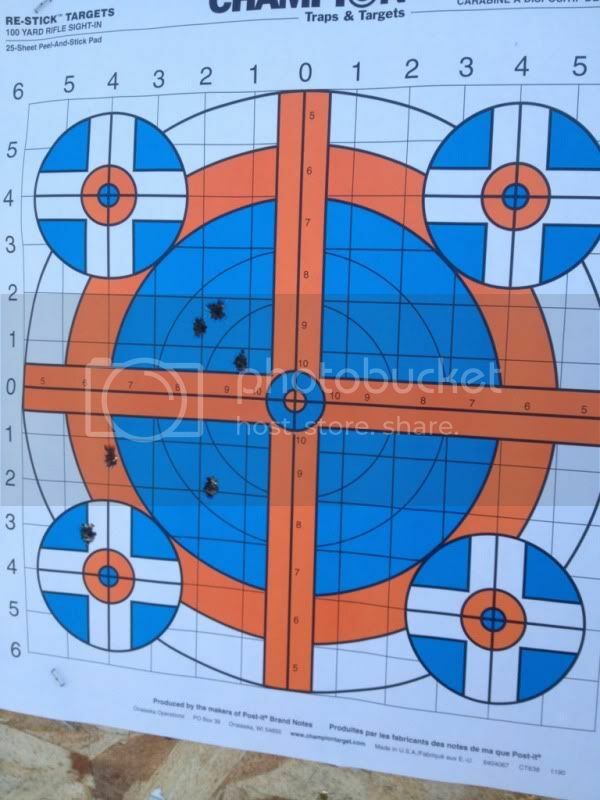 -The COL can be very important as far as obtaining the best accuracy from a firearm, and the COL listed in the manuals will seldom provide the best accuracy in your firearm. 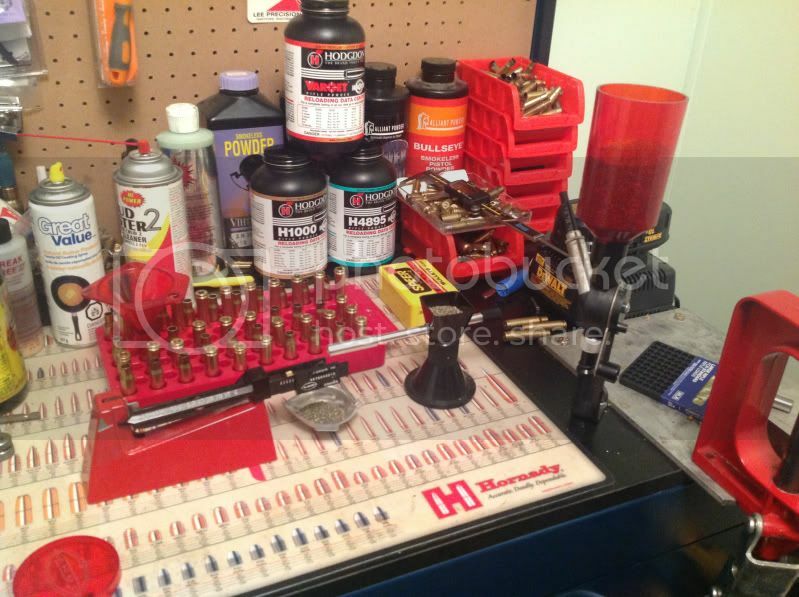 The best COL for your firearm,can only be determined with your firearm. 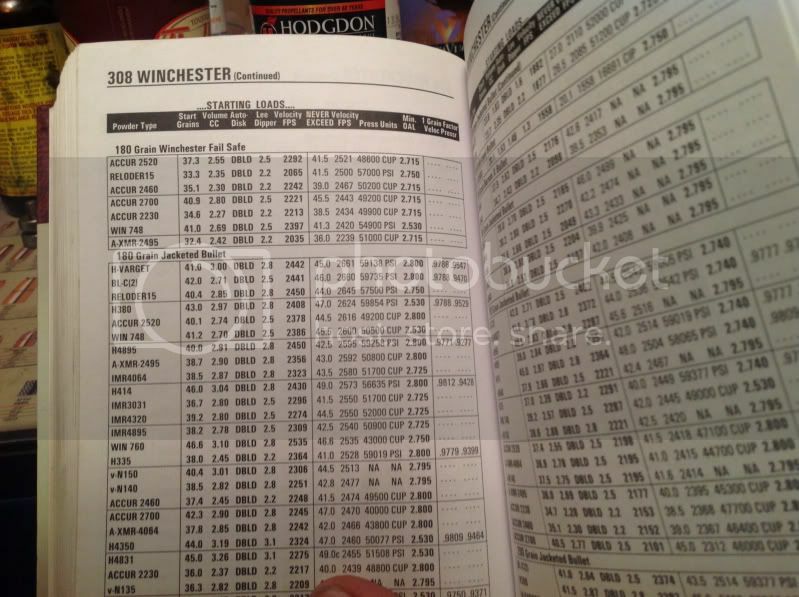 -The velocities, and supposed "most accurate load" listed in a manual, are for that specific firearm, and those specific lots of components, and they can vary significantly in your firearm. -When you change any component, back off the powder charge, and work up the load again. -Loads that are perfectly safe in cool temperatures, can cause excessive pressures in warm temperatures. -Since pressure signs don't usually appear until you are well past the normal operating pressure for the cartridge, I like to back off the powder charge until they disappear completely, and then back off a little more. Last edited by elkhunter11; 02-10-2013 at 08:21 AM. here are some common pressure signs i think i found on this forum a little while back! -Case bulging, particularly near an unsupported part of the head. -Case crack along side (may mean excess pressure, but may mean brittle, defective, draw mark scored, or worn out brass). -Case head expansion (CHE; may mean high pressure, may mean nothing in isolated case). -Case head separation (may mean high pressure, but may mean excess headspace or worn out brass). 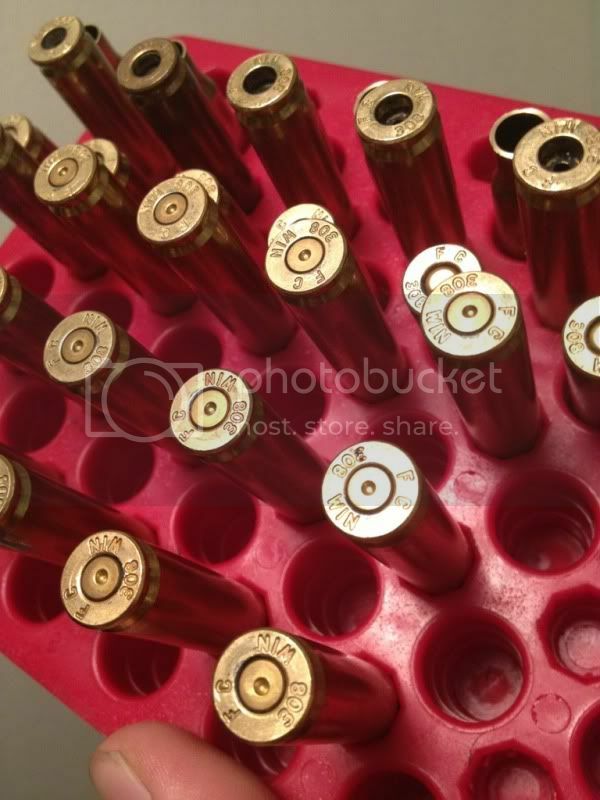 -Case splits in body in fewer than 10 reloads-back loads down at least 2% (can also be due to ammonia vapor exposure or a brass defect in an individual case). -Case mouth split (may mean high pressure, but more often means case needed neck annealing). -Case pressure ring expansion (PRE; not much more reliable than case head expansion but may mean pressure is excessive). -Case primer pockets getting loose in five reloads or fewer. -Case, excessive stretching (this is actually visible pressure ring area stretching which may be due to excess pressure or to excess headspace). -Case, extractor or ejector marks on head, especially after increasing powder charge. Most common in semi-auto rifles, but can happen with any extractor and ejector (may be high pressure or bad timing, or an extractor standing proud on the bolt face). -Case, won’t fit back into chamber after firing. -Gas leak (see Primer Leaking, below). -Groups start to open up at or beyond a suspected maximum load pressure. -Incipient case head separation (starting or partial case head separation or signs of it). -Increase in powder charge gets unexpected velocity. Look for an orderly progression of muzzle velocity vs. charge weight. If muzzle velocity stops going up or actually goes down, or if it goes up too much, you have a problem. The first two indicate steel is stretching. The stretch may just be due to uneven bolt lug contact, or it may mean you are stretching the receiver and fatiguing the steel abnormally. Unexpected velocity increase indicates unexpected pressure increase. With any abnormal velocity, you should back the charge off 5% from where it started. If, based on manuals, the load and its velocity seem too low for this to be happening, get your gun inspected or bolt lugs lapped and try working up the load again. -Primer blown (primer falls out when gun is opened; same as loose primer pocket). -Primer cratering (may mean high pressure, or it may mean a worn firing pin or firing pin tunnel, or may mean you have a new production Remington bolt with chamfered firing pin tunnel). -Primer flattening (may mean high pressure, or may mean long headspace; some loads always make flat primers; softer primer cups (Federal) flatten more easily than harder ones (CCI), so it also can mean nothing at all). -Primer, mushrooming (may mean high pressure, or may mean long headspace). -Primer, piercing (may mean high pressure or may mean incorrect firing pin protrusion or incorrect firing pin nose shape). -Primer, leaking gas around primer pocket (may mean high pressure, may mean loose primer pocket in case, may mean damaged primer was inserted, may mean primer backed out too far during firing, which excessive chamber headspace makes possible). -Case, short life -back load off at least 2% (under 10 reloads in non-self-loaders or with military brass in self-loaders, 6 or less in self-loaders with commercial brass). -Case, sticky or hard extraction (especially in revolvers this is a positive sign to knock the powder charge down at least 5%, in rifles also look for chamber ringing). -Case, torn or bent rim (from hard extraction, see #24., above). -Case, primer pocket expanded and won't hold newly seated primers firmly (PPE; this is likely no more accurate than CHE (3., above), but is a more sensitive measure for those with tools that can measure the inside diameter of a primer pocket repeatably to the nearest ten-thousandth of an inch). -Velocity higher than manual maximum load velocity for same powder and barrel length. For example: one fellow using a .243 Win load one charge increment below the manual maximum got velocity 200 fps higher than the manual claimed for its maximum load's velocity. His single-shot action was popping open at every shot. With QuickLOAD we were able to calculate he had about 77,000 psi. An alternate explanation, if everything else is normal, is that your chronograph readings are incorrect. 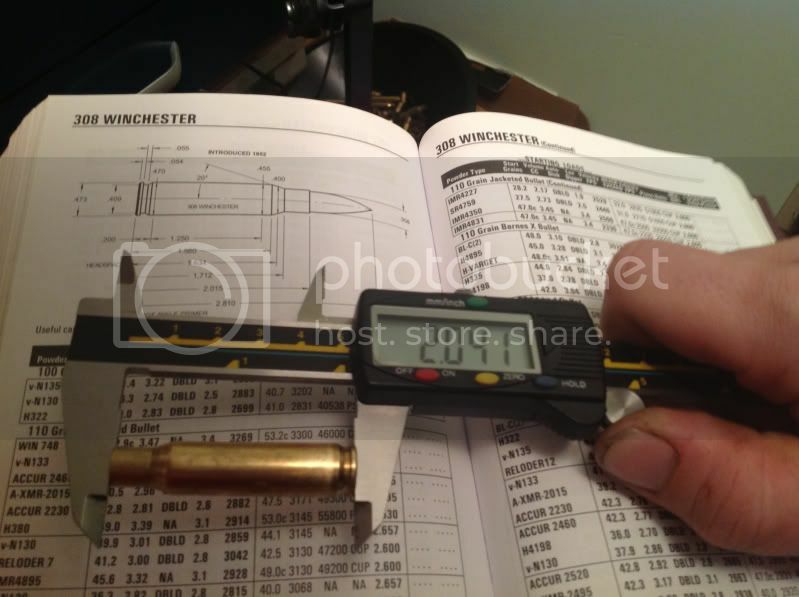 It is not uncommon to get high readings due to muzzle blast when the chronograph is too close to the gun. I recommend 15 feet minimum, since that is what the manual authors typically use and is what you are comparing to. Some big magnum rifles need even more distance. More threads like this would be a great asset to the forum, as opposed to the rant threads! Great tutorial for the uninitiated and also great responses from those more experienced hand loaders! I do ask that if your going to post tips in this thread to please include pictures as a visual aid. I know exactly what you mean, there are many of us here who get PM's and questions every day on fire arms, handloading, shotguns, huntingn , etc, because they are tired of the open forum crap that some ,members seem to put out there when an honest question is asked. Thank you. Was going to start a thread in the spring from a new reloader's point of view as a primer of the absolute basics beginnings as i learned going along. Glad you beat me to it so I won't have to. Great job. More collaboration, less flame wars. If you're reading this, why aren't you in the woods? Stupidity is taxable and sometimes I get to be the collector. 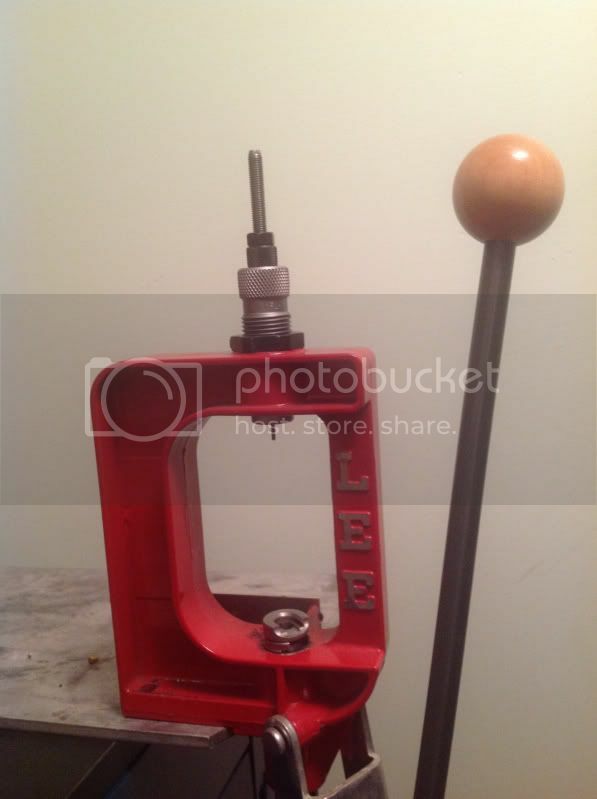 This lubricating business, some guys on here have never stuck a case, and I have broken a lee press like the one in the picture. Elk says to clean the die if you are getting dents, I am, I'll do that and see if that solves it. I have the Lee trim parts but am unsure how to use the drill, or better yet a drill press. Do you just chuck the shell holder? Again wonderful pictures and a great post. Sometimes some lubes will cause dents no matter how hard you try... I haven't had that issue with imperial wax yet... A little go's a long long way. Thanks very much, I haven't stuck a case for 2 years but that is a long way from never, every time I pull down on that sizing die I worry the case wont come out. I'll take the advice and use less lube and really give the dies a good cleaning. Remember my little comment about starting loads? 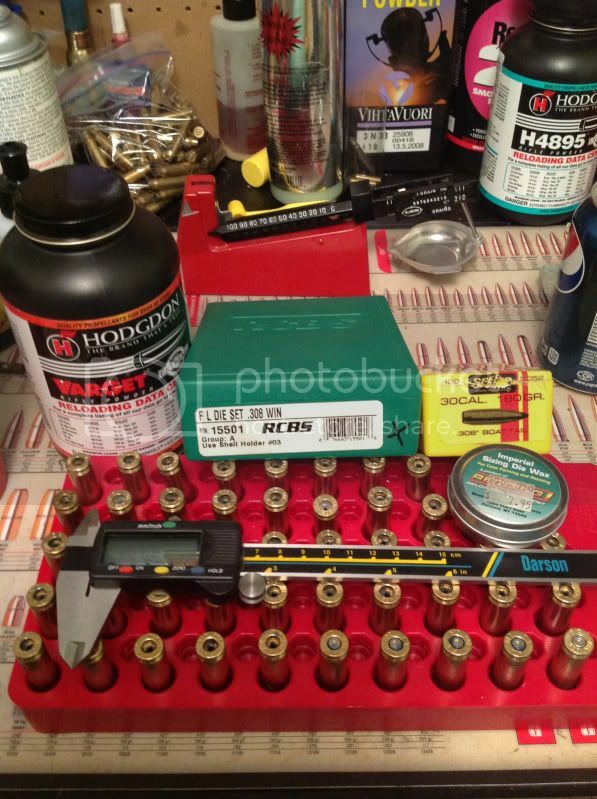 This is why we start at the minamum load and work up, my Lee manual gave me a starting load of 41 grains and a max of 45 grains, at 43.5 grains recoil was pretty stout with an ejector print on my case heads and at 44 grains I was getting a sticky bolt. 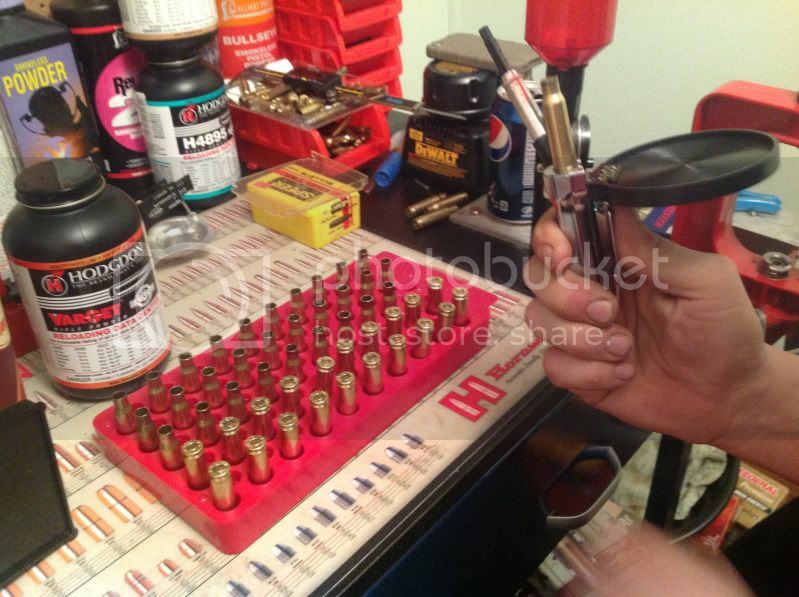 One of the most important aspects to reloading is knowing how to detect pressure signs....and also keeping in the back of your mind that there are really very few (if any) safe shortcuts to take. This is why it's important for you all to read threads such as these and ask the silly questions without fear of being laughed at... if you don't know you can get hurt. I do see it. Thank you for pointing it out. And do not worry I am full of silly questions and will ask a ton just for you! Some of the better bits of product usage and reloading step explanations I have found, that are well explained and illustrated. A person can get an understanding of some the steps involved and some of the equipment available and what it does. Tools such as calipers and a micrometer are absolutely required. I agree Cat and I thank each and everyone on AO who takes the time to explain thing that they have had experience with , that is how we all benefit and learn. As someone brand spankin' new to reloading, thank you HotWheels and others for this awesome thread!!! Super excited to hand load some rounds for my 7mm! Another future reloader here..... I have ordered the RCBS Rock Chucker kit. It will be a while before everything is set up and ready to roll though! Threads like these are great, as well as having a mentor. I have a good friend to coach me . There may be some I missed! !